Learn how to run a remote company successfully. The world is changing, and you’re invited to join the change. Technology is enabling businesses to operate on an extremely lean budget with virtual employees and effective time-tracking software with actionable data. Measurable data enables businesses to make smart decisions, which is what makes a company successful. This technology is the cornerstone of Hubstaff, as we focus on continuous improvement. Hubstaff helps more than 7,000 remote businesses operate more effectively every day. Since we operate our own remote business with the tools that we develop, we understand how important it is to bring teams together and make communication more effective. Although communication is the core of every team, it becomes even more vital to have the right communication tools when working in a remote environment. Hubstaff tools focus on getting management the data needed to make informed decisions about their staff and real-time insight into what their teams are working on. However, effective communication is a two-way street, so we make it effortless for your team by providing tools that consistently supply information to management. Let’s start with solving three real-life scenarios. Hubstaff solves these business problems for new customers every day. Problem: Managers and/or owners do not receive the information they need from their teams. One of the things that we’ve learned through working with thousands of remote teams at Hubstaff is that managers are not getting the communication they need from their teams. This is usually the case because it’s hard for team members to get into the habit of creating a “work dialog” of what they are doing on a daily basis. This includes the projects that a team is currently working on, what specific tasks are being done, and what progress is being made. Most managers don’t know the details of what their employees are working on. Often, all they understand is their staff is doing “customer support” or “developing X feature.” This lack of detail is a problem, especially when issues arise and management needs to find the specific team member involved with the problem. A typical team member is usually tasked with multiple projects simultaneously, which makes that detailed communication difficult, although necessary. If priorities aren’t set effectively, you could have a management disaster. It’s a combination of management problems, team member problems and above all communication problems. On the Macro level, business owners receive data reports that show the exact projects and tasks that team members are working on. 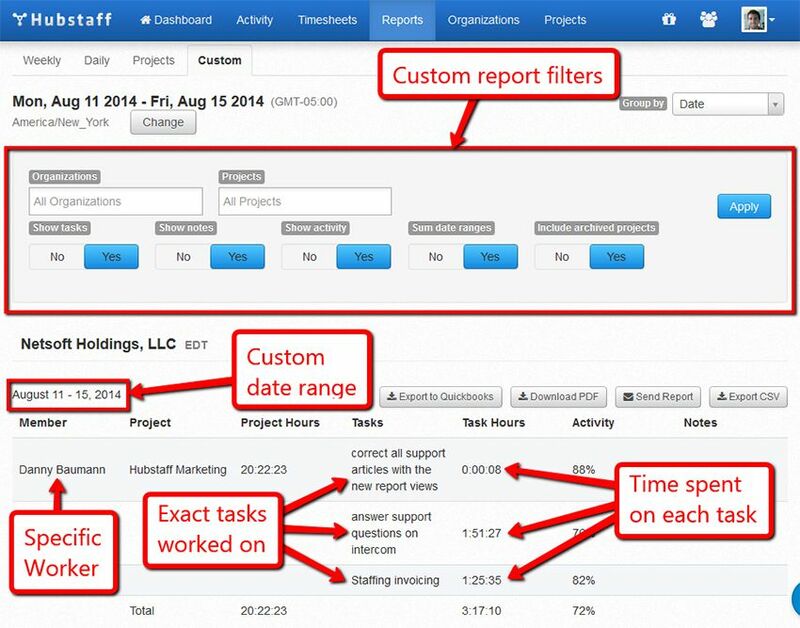 Tracking time is a simple as clicking a button, and team members can change projects as they work in real time. You can then view these reports by day, week, month, etc… to get the information that you want. You can see from the image above that a business owner can see exactly what a particular employee has worked on over the past X days. This is automated large-scale business intelligence. You can now take that time data and use it to reduce your administrative and clerical work. Manual timesheets are a thing of the past. Tired of sending follow up emails to figure out what your team is working on? It’s no longer a problem. Is it hard to figure out the exact amount of time that you should invoice clients for? Hubstaff makes invoicing virtually automatic. Once you have insight into how your team spends their time, things become much simpler. Fill out the form below to receive further information!